The word ‘ensuite’ always sounds so wanky…like we have 7 bedrooms and bathrooms or something but basically, this house only had one bathroom, the master bedroom was almost ‘too’ big on its own and there was already a giant cupboard in its place that was screaming out to be turned into an extra, handy bathroom. 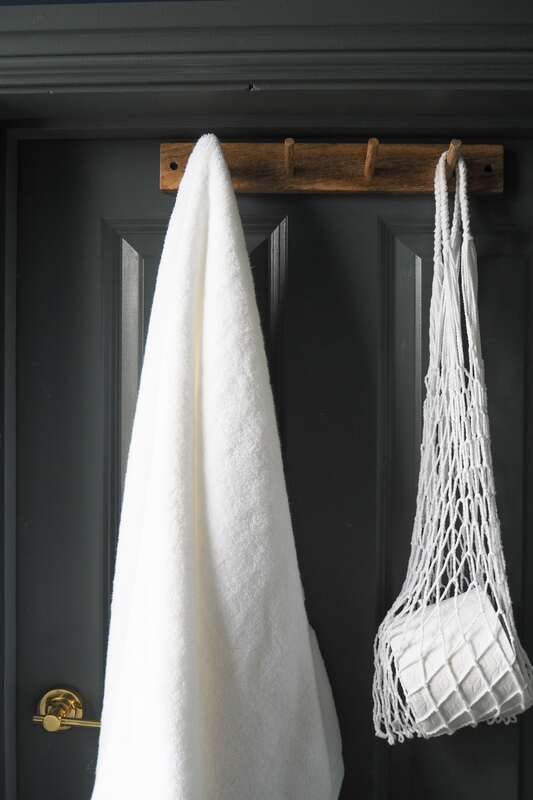 Bath towel: Draper London. Hooks (available in black): £3.99, H&M Home. Door: Doors World. Drawers: £115, Next. Floor tiles: Topps Tiles. Wall tiles: Ca Pietra at Ripples Bathrooms. Sink: £79.95, Victorian Plumbing. Door and frame painted in ‘Downpipe’ by Farrow & Ball. 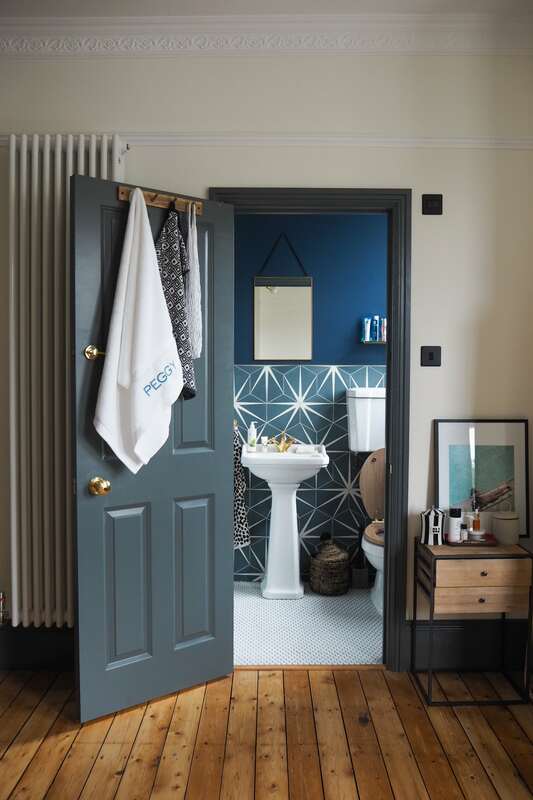 Bathroom wall painted ‘Breton Blue’ by Dulux. So we present to you our ‘ensuite’. 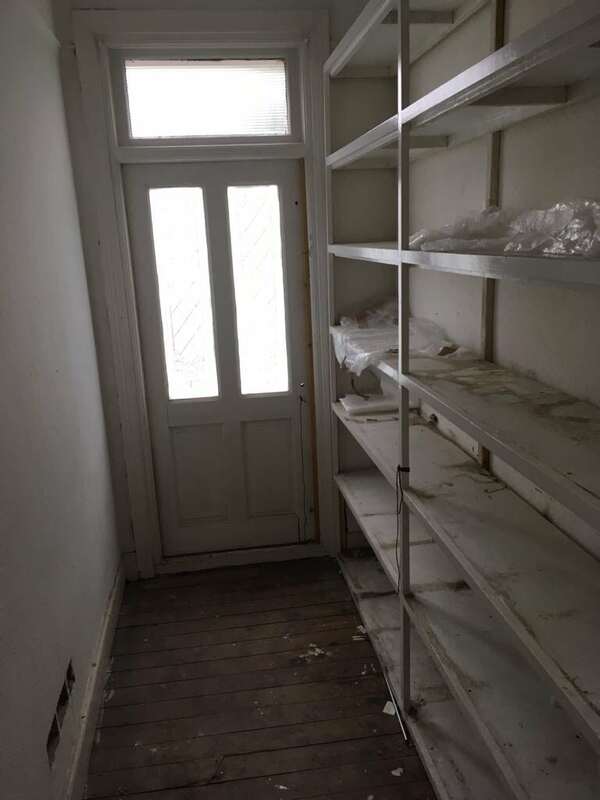 Before we started the work, there was a massive cupboard here which led to a door which led to a balcony. It was overbearing and frankly, rather unnecessary and you had to close the door behind you in order to open the door to the cupboard. 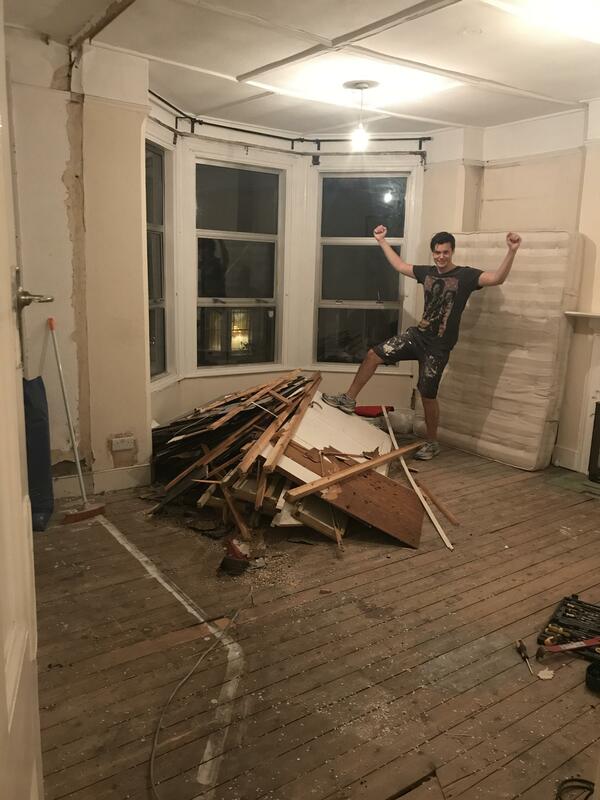 Chris feeling very proud after knocking the cupboard down and the space we had to play with after Mick the floor sander had been round. 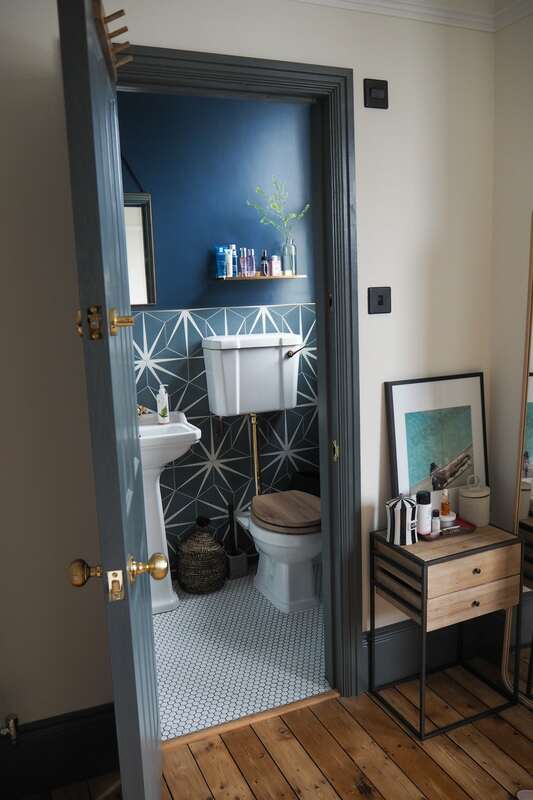 What was amazing about this part of the renovation is that even after adding the ensuite, we gained quite a lot of space in our bedroom, as the ensuite was still smaller than that large cupboard! A few houses down the road had already added a bathroom here (including next door) so we decided the switch the door to a window and then found out we needed to add a soil pipe to the outside of the house (we still kept a door to allow access to the balcony from the bedroom but more on that another time). This was a dirty job but better to do it early on than try and add a bathroom once the front of the house was sorted. The trench the builders had to dig for the pipes. All in all, the work took around 5 months. 3 months of building, and 2 months of decorating and finalising (bear in mind we had a baby somewhere in the middle!). The ensuite was part of a bigger job, as we did the hall (which we’re still working on) and bedroom at the same time. We basically started from scratch, knocking back to the brick and replastering/waterproofing/fitting windows etc. 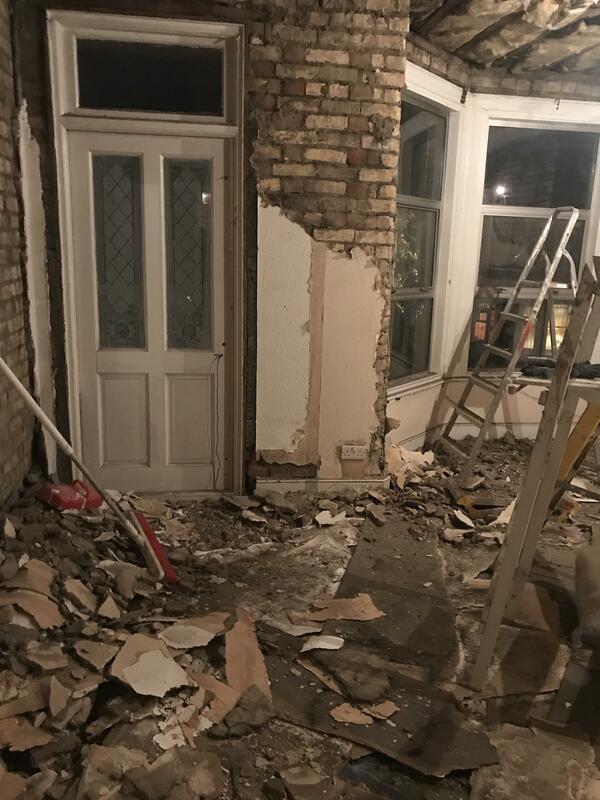 The reason for going back to the brick was because the original plaster was lath plaster which was all coming away and with years of rot, patch jobs and weird ceiling papering it was weirdly almost easier to start again. When you start from scratch, it is pretty satisfying as everyday there is something new to see and the progress is easy to see. Those that followed on Instagram Stories will know how excited I was to come home every night and see the difference. And the tiles sure helped make the difference really noticeable. 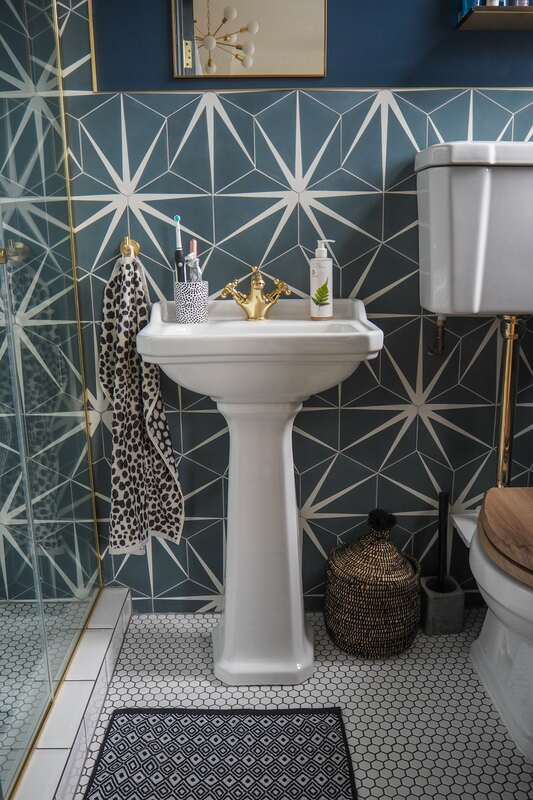 We knew we wanted encaustic cement tiles but couldn’t really afford to cover the entire bathroom. 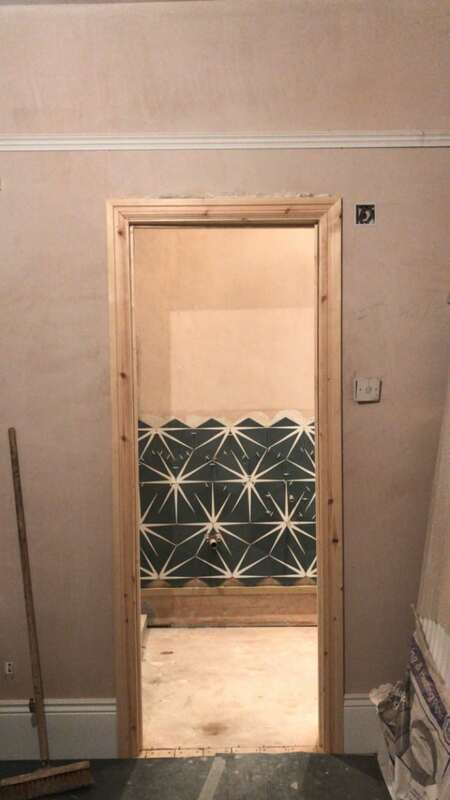 So after a lot of thought, we decided to ‘stick to what we knew’ and did Metro tiles on the other walls. But to make it a little different, we thought we’d try the ‘herringbone’ style (much to the annoyance of our builders!) – we were a bit worried about it being a bit much with all the different textures but actually, I think it made it even more interesting. Brass shower: Amazon (I can’t find our exact one now, ours was a brand called Senlesen, but this one here is very similar). 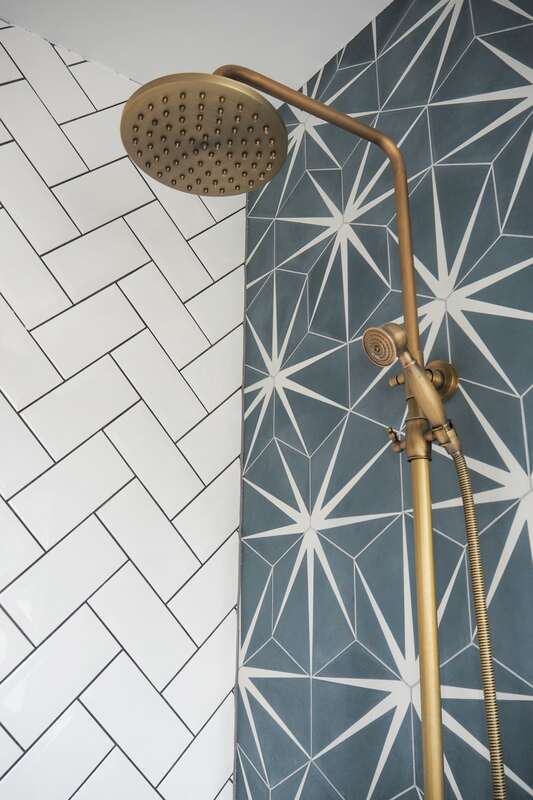 Patterned wall tiles: Ca Pietra at Ripples Bathrooms. 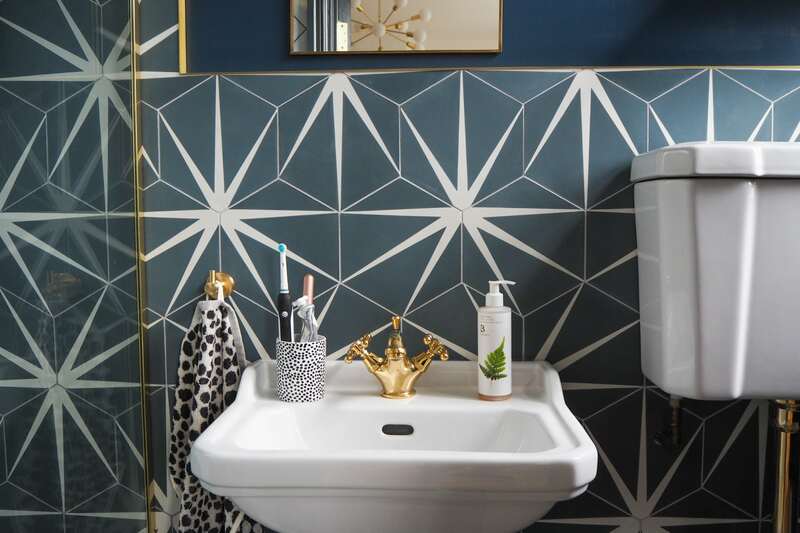 Metro tiles: Topps Tiles. 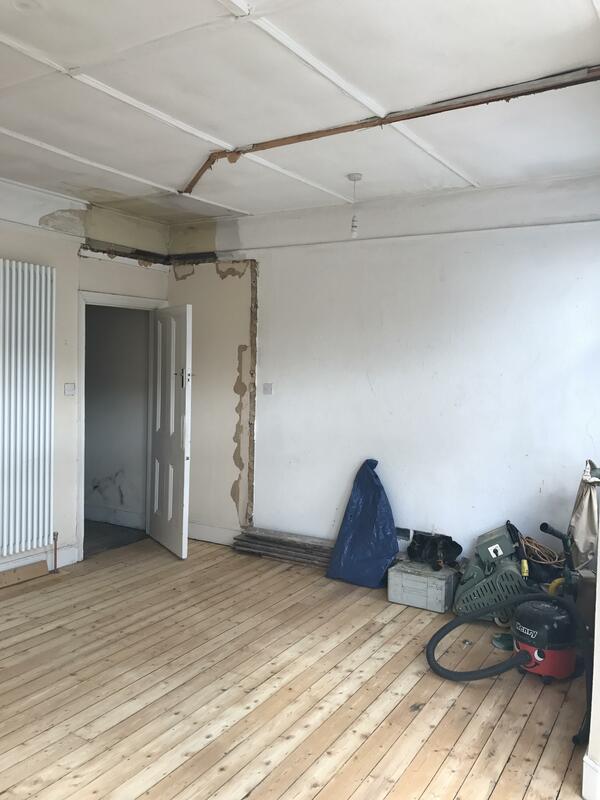 We knew we wanted to go for brass fittings this time around, having missed out last time (too pricey and we didn’t have the time to research into cheaper alternatives) – but be warned, it takes A LOT of time finding all the individual details. 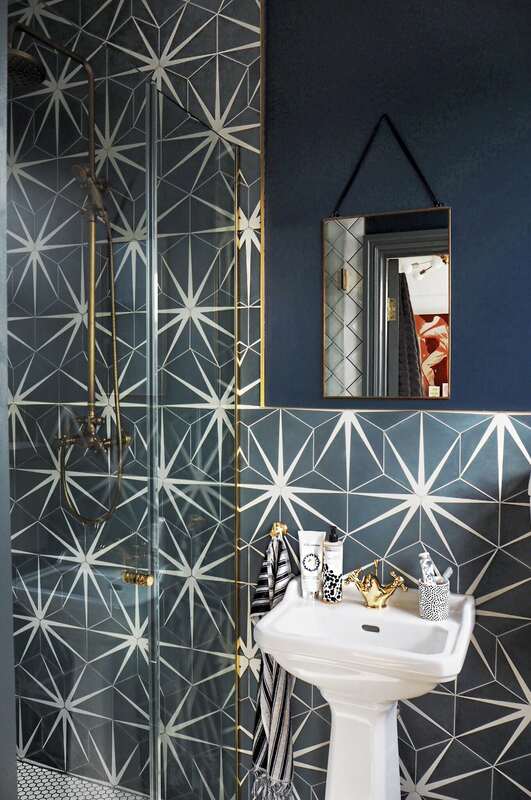 Despite Pinterest being all over the brass and black finishes, the UK market just hasn’t quite caught up and the brass items are way more expensive. Google was my friend, as was a bit of spray paint and eBay. 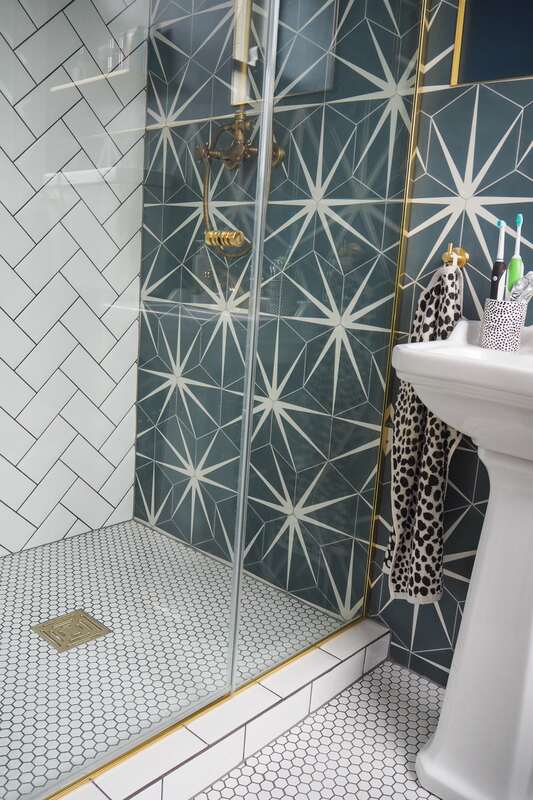 The brass tile trim we found via an online search: Wet Room Supplies. The grout is ‘Ash Grey’ via Topps Tiles.Metro tiles: Topps Tiles. Biotin shampoo and conditioner: Tresemme. Shower mousse: Radox. Brass hook: £19.95, Victorian Plumbing. Tap: £99.95, Victorian Plumbing. Hand towel: H&M Home (available in mustard here). Toothbrush holder: H&M Home (old). Sink: £79.95, Victorian Plumbing. Handwash: £14, Bramley. Brass shelf: £30, Cox & Cox. Paint: ‘Breton Blue’ by Dulux. 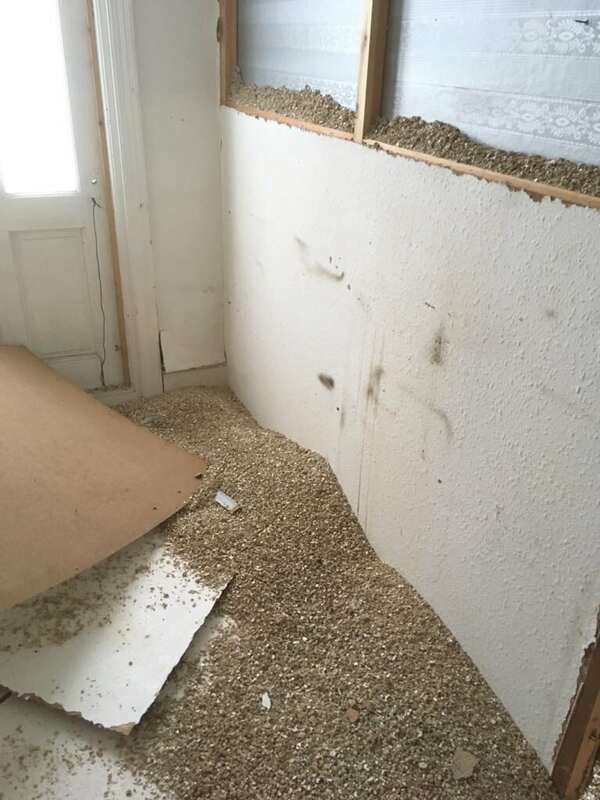 The builders did all the structural work and tiling and we painted the room to save a bit of the cost where we could. 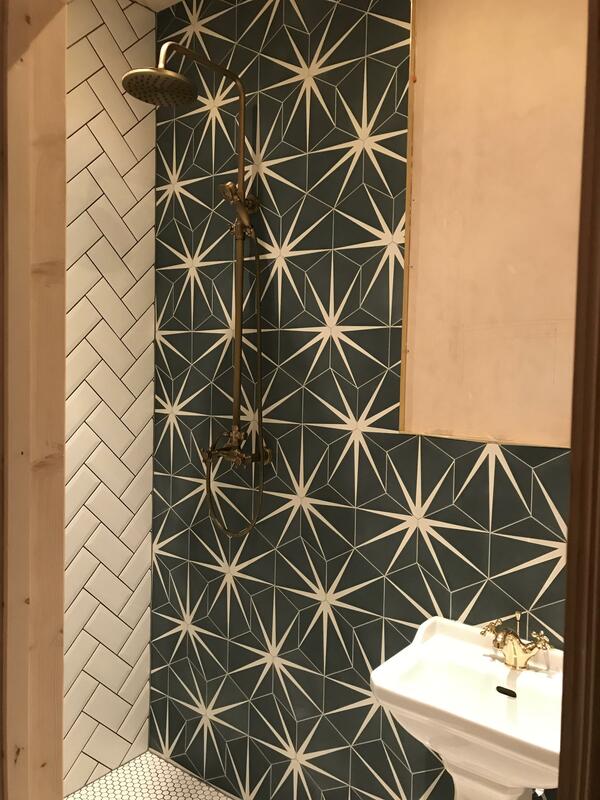 DO research encaustic tiles properly if you’re considering using them. 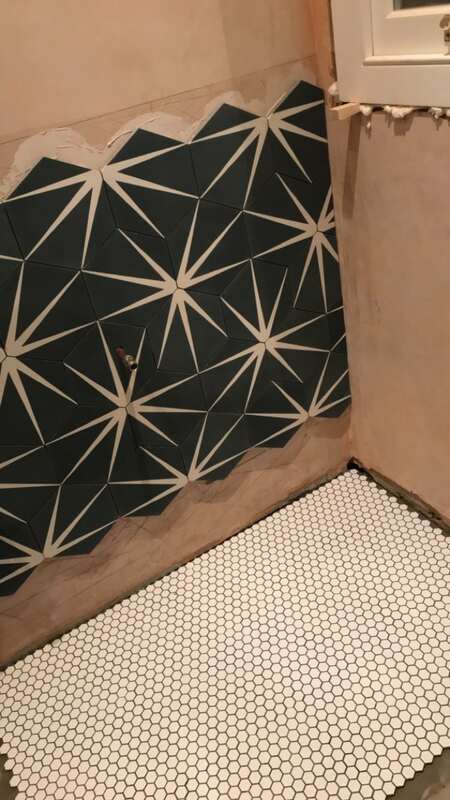 They need a lot of sealant, careful grouting (we used light grey here as dark can mark the tiles) and a lot of patience (you also have a lot of waste as, due to the pattern, you can’t re-use a tile once cut). They also need resealing every few years. I’m so happy with them but it is worth thinking about if you’re too timepoor to give them too much care. 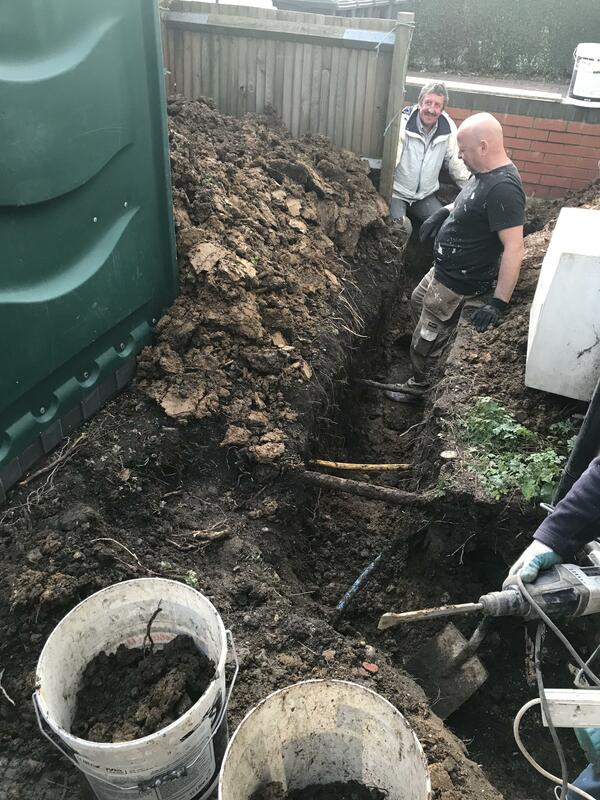 The wet room was something our builder was unsure of initially but after we had to add the soil pipe in, he said we could have it after all and again, this excited me greatly. We went for a step into the shower to separate it in the room and continued the hexagon flooring to keep the continuity. The shower isn’t as big as it looks, but because of the high ceilings in the room, it looks enormous and the tiles going all the way to the ceiling help give the illusion of space. The shower door we ended up getting made from a glass manufacturer as the dimension and opening, due to the sink and the small space, again (!) proved tricky. I didn’t want a frame on the door and didn’t really want to compromise so this ended up costing us a lot more than expected meaning we had to save buying it for a few months (the main thing that held us back). But again, we’re doing this up as our forever home and I couldn’t have asked for a better finish. Door handles and lock via my family’s shop: Saxon Security. Radiator: £64.95, Victorian Plumbing. As it’s such a small space, size of items and storage is something to consider. We initially bought a sink that, although fitted when we looked online, was so cumbersome when we tried it in the space. 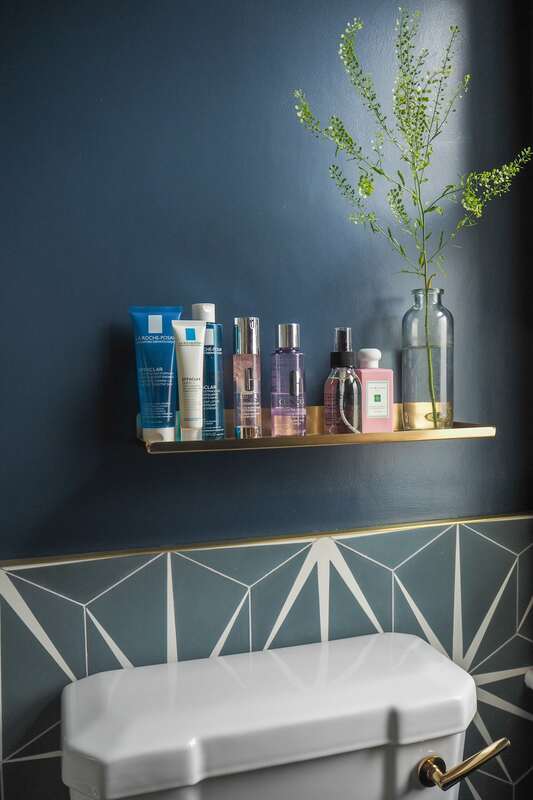 We went for a small but functional radiator to fit on the bit of wall that was redundant otherwise, a less imposing sink, hooks that can hold toilet roll holders, towels as well as clothes all at once, a slimline toilet and I stocked up baskets to hide all the nasties. 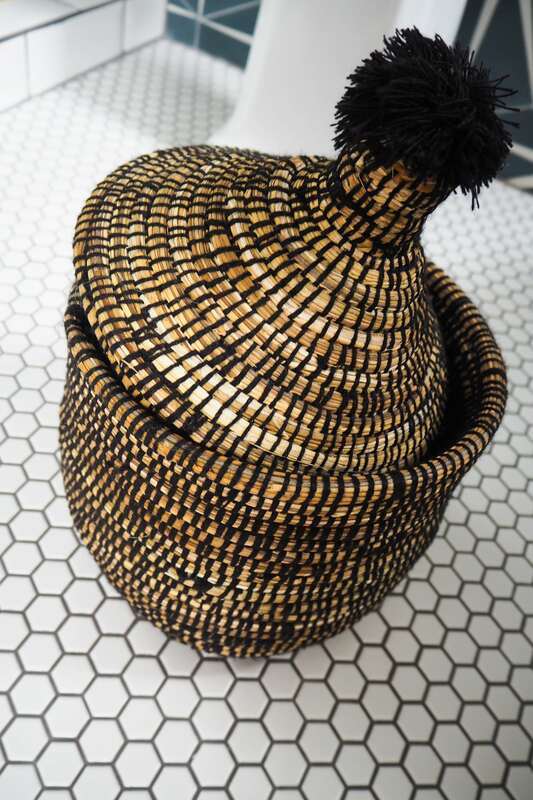 Storage basket: £38, Atelier Buffo. Toilet: £219.95, Victorian Plumbing. Door handles and lock via my family’s shop: Saxon Security. Again, the toilet provided lots of issues. We ended up buying a bog standard (pun totally intended!) version and then bought the wooden seat and gold flush separately. The brass version of this toilet was more than double the price, so instead we bought a brass flush pipe on eBay for £30 (turns out, they’re universal) and then sprayed the hinges gold as couldn’t get hold of gold ones in the right size. 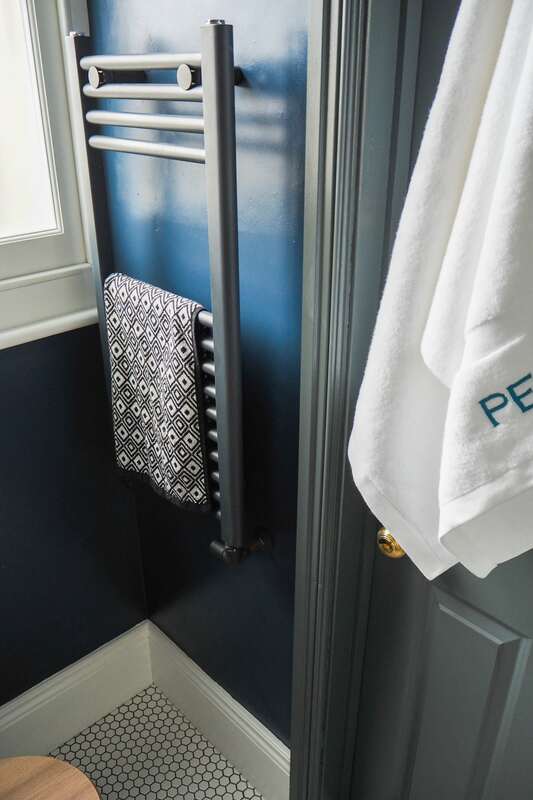 We used Rustoleum spray paint but with a primer spray first – we also sprayed the shower grate as it was a tricky size to replace (we tried for weeks and gave up!) – to be honest the hinges don’t look as good as the shower grate as we had to roll on its side to let it dry etc but to the untrained eye it’s fine and you have to pick your battles (especially with a newborn to care for in the background!). So I *think* that’s pretty much everything! There was a lot to discuss in such a small space, really. 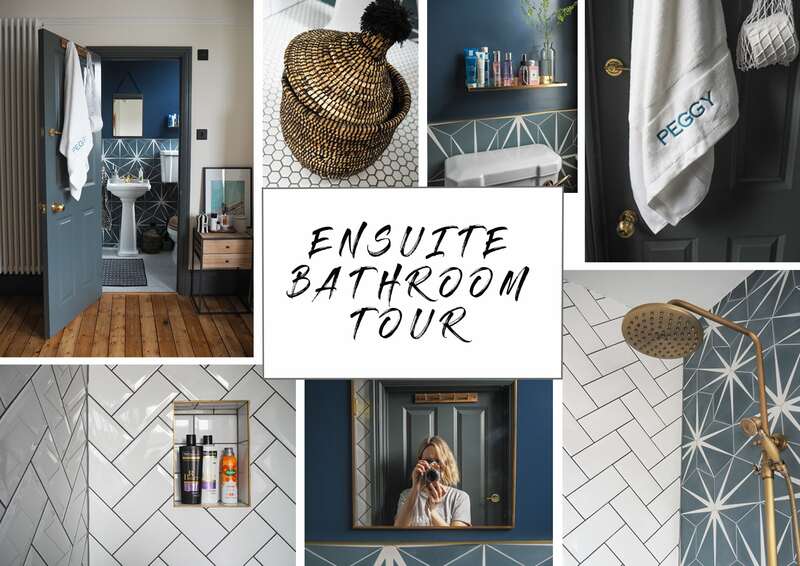 To us, this ensuite really has the ‘wow’ factor and it brings joy to me whenever I get the chance to use it (which, to be honest, is not every day with Peggy’s nap schedules in our bedroom!). 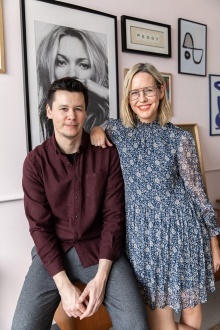 We have also filmed a video for YouTube (and you can subscribe to my videos here) where you can get a bit more of a feel for the room, and probably answers a few more questions – but anything else, let me know! absolute dream bathroom! saving straight to my pinterest! 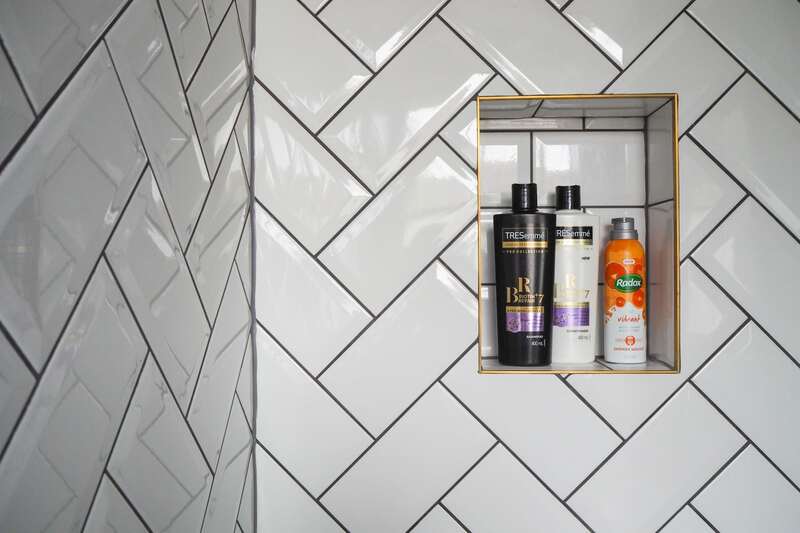 In the spirit of doing it yourself as finding a product online is impossible… We have a shower waste in chrome and all our fittings are matt black. Wondering if the primer and spray trick will work on plastic…? Any advice you have time for would be amazing! Love it and also the fact you used the word wanky!!! Hilarious ? I feel like ‘ensuite’ is up there with the word ‘fiance’ ! I know you’re intending this to be your ‘forever home’ Alex, but I’m not sure where I’ll get my renovation inspiration from when you are done. Though maybe by then you’ll be on to a holiday home! Hope so. This is lovely, you must be so happy walking into it each morning. Aaah thank you!! Ha – I always say we’ll stay here forever, but the renovation bug might have taken me over! Hi! 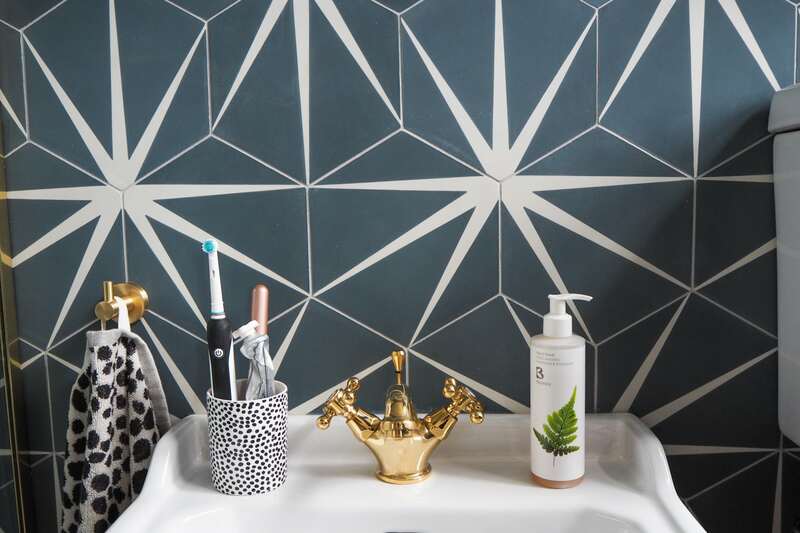 I love the bathroom, could you share which spray paint you used for your shower drain please? Wowza! It’s looking incredible Alex, you guys did SUCH a good job! I’m so stealing your idea of loo roll in a string bag… who knew they could carry more than lemons for insta?! And quick q… sorry if I missed it but where did you get your loo brush? It’s so tricky to find a nice one! Hi – do you mind me asking where your loo roll holder and brass hook are from? I’ve seen similar in JL, but looking for other options! The new bathroom looks so awesome!! I love the paint color so much!